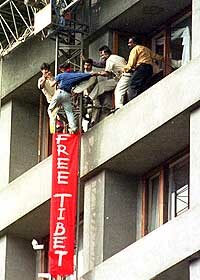 Twenty-six-year-old research scholar Tenzin Tsundue today tried to unfurl a three-storey-high banner of 'Free Tibet' from the twelth floor of The Oberoi, Nariman Point. However, a police team, worried that he was planning to jump off the building, spread a safety cordon complete with a safety net. At around 10.45am, amidst a minor scuffle, Tsundue was pulled in from the window where he was precariously perched. Cuffe Parade police said that Tsundue is in their custody and that he was not trying to kill himself. Tibetans exiled in India and friends of their cause have been holding a series of protests all over the country to coincide with the visit of the Premier of the State Council of the People's Republic of China, Zhu Rongji. Tsundue, an MA in history researching the oral histories of the Tibetan people brought by them to India while fleeing to this country. He was the winner of the Outlook essay competition last year. The topic of his essay was 'My Kind Of Exile'. Prime minister Zhu Rongji is accompanied by his wife, Lao An. He is on a six-day visit to India from January 13 to 18. Rongji was visiting the Chhatrapati Shivaji Vastusangrahalaya (formerly Prince of Wales Museum) at the time of Tsundue's protest. The Maharashtra Tibetan Refugee Association and Friends of Tibet (INDIA) had organised a 24-hour hunger strike at Azad Maidan. The strike that started yesterday evening when Rongji arrived in Mumbai, will be till 5pm today when the Chinese delegation leaves the city. Similar protests have been planned in other cities.